Two of the men on the Han Solo shortlist discuss the role. Jeremy Renner wants a Hawkeye Netflix show. Amber Heard confirms her Aquaman part. Liam Cunningham talks the next season of Game of Thrones. Plus, new Warcraft footage, a new look at Wynonna Earp, and teasers for The Walking Dead’s season finale. Behold, spoilers! Latino Review claims to have details about Laura Dern’s character in the movie: allegedly, a Resistance Officer in command of a ship. 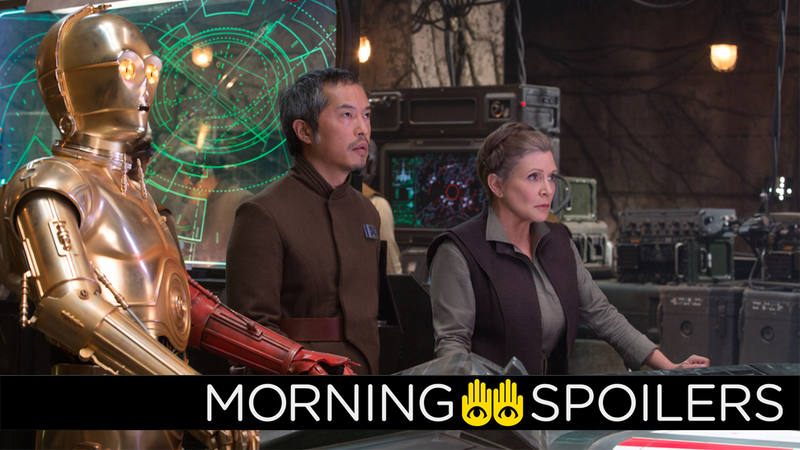 She features in a scene where she informs a group of battered soldiers, including Poe Dameron, that they are the “last of the rebellion,” as well as that General Organa has been gravely wounded in some kind of attack and is undergoing medical attention. Later on, they continue, Poe will lead a mutiny against Dern’s character, taking control of the ship and holding her at blaster-point. They’ve just written it and they’re still doing tweaks, but I think we should be recording this month. The story is great, and they exude quality. What I know about that whole team is that they wouldn’t just put something out to put it out. That’s why it took them so long to even announce that we were doing a second one. Generally when you have a first successful movie you want to make a second one. It took them a while because they wanted to figure out what story they needed to tell and what would be important and engaging and I think they found it. I am looking forward to it, absolutely. It’s interesting. It’s like, half suit of armor, half scales. It’s strange… We’re in the process of building it now, so it’s coming along. I had never even seen any of the original Star Wars movies until maybe a month or a couple weeks before my first audition, because I was like, ‘I should check this out!’ It holds up. I’ve heard this rumor, yes... I mean I’ve seen the stuff on the Internet, and I think any lad of my age would kill to play a part like that. It’s very, very flattering. I’ve no idea if there’s any truth in it but I mean, Lucasfilm, Disney, if there is then you know where I am. Their issues are very much about communication—being able to talk to the other person and trusting that what they say is taken at face value. Here’s a new picture of Gal Gadot in action as Wonder Woman. He gets sucked into stuff that we’ve never seen him do before, against his better judgment. We will see him doing things that we haven’t seen him doing before. That’s not a sexual reference, even though it f—king sounds like one! Facebook fan page/spoilerific repository The Spoiling Dead Fans Facebook page claims to have revealed another scene from this season’s finale, featuring Morgan coming across a camp of dead survivors and a wounded Carol, who panics when her rescuer says that they’ll camp out the night before heading out to get help. LITTLE MISS TYPE A — Liv (Rose McIver) and Detective Babineaux (Malcolm Goodwin) are investigating the murder of Bailey Barker (guest star Haley Marie Norman “Fired Up”), a type-A, ambitious, hyper-competitive and driven student near the top of her class. After consuming Bailey’s brain we see Liv become very much like the girl she was before becoming a zombie. Meanwhile, things seem to be going from bad to worse for Major (Robert Buckley, and Blaine (David Anders) reaches out to Ravi (Rahul Kohli) for help. Finally, here’s a new “sneak peek” explaining the basic setup of the series.